A small dual control two-seater, designed for training purposes. Very great attention has been paid in design to ease of manufacture and interchangeability of parts. As an instance of this it may be noted that ailerons, rudder and elevators are all identical and interchangeable. The following are the leading particulars. Type of machine Two-seater Biplane (dual control). Name or type No. of machine B.A.T. F.K.24 "Baboon"
Purpose for which intended Training. Chord 5 ft. 7 in. Gap, maximum and minimum 4 ft. 8 1/2 in. Dihedral 2 deg. upper and lower planes. Overall length 22 ft. 8 in. Overall height 8 ft. 10 in. Total area of planes 259 sq. ft.
Ailerons On upper and lower planes. Span of tail 9 ft. 10 in. Total area of tail 27.75 sq. ft. (including elevators). Area of elevators 12 sq. ft.
Area of rudder 6 sq. ft.
Area of fin 5.25 sq. ft.
Max. cross sectional area of body 7.5 sq. ft.
Side area of body 52 sq. ft.
Engine (type and B.H.P.) 170 A.B.C. Wasp I.
Revs, at nominal b.h.p. 1850 r.p.m. Propeller (make and type, etc.) B.A.T. 2 blade Tractor dia. 7 ft. 10 in., pitch 5ft. Weight of machine empty 950 lbs. Load per sq. ft 5.2 lbs. Weight per h.p. 7.95 lbs. Tank capacity In hours 2 hours. Tank capacity in gallons 12 gallons. Disposable load, apart from fuel 400 lbs. Weight of Instruments 12 lbs. Total weight of machine fully loaded 1350 lbs. Speed (at ground level) 90 m.p.h. Climb to 10,000 feet 12 mins. 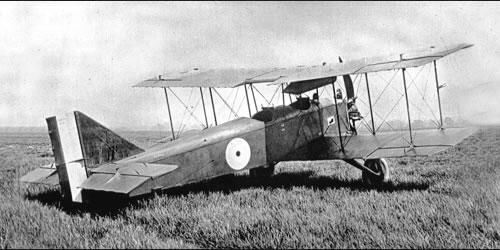 Although not pursued beyond the prototype phase, the 1918 BAT FK 24 Baboon two seat trainer, built to an Air Board requirement, is of interest in terms of its choice of engine, along with aspects of its structure. Its power came from the specified 170hp ABC Wasp I radial, an indication, albeit later shown to be ill-judged, of the faith officialdom placed in the ABC radials. The Baboon's structure was not just robust, it was deliberately designed to use as many interchangeable components as possible, including the ability to switch upper with lower wings, plus being able to swap port and starboard elevators with the rudder. The machine's extra wide wheel track is also notable. Top level speed of the Baboon was 90mph at sea level, while climb to 10.000 feet could be achieved in 12 minutes. Seen here is serial no D 9731, the first of six ordered and the only one believed to have been completed. STARTERS IN HENDON'S AIR RACE ON SATURDAY: Left to right - B.A.T., piloted by Major Draper (winner; Avro, pilot Capt. D. H. Robertson, A.F.C. ; Avro, pilot Major R. H. Carr, A.F.C., D.C.M. (second); G.-W. Bantam, pilot Capt. P. R. T. Chamberlayne (third); and Avro, pilot Lieut. G. R. Hicks, D.F.C.